Three weeks ago, New York Times reporter Cade Metz sent shockwaves through society with a startling announcement that A.I. researchers were making more than $1 Million dollars, even at a nonprofit! AI super-hero and newly minted squillionaire Zachary Chase Lipton feeds a wallaby bitcoins while vacationing on Elon Musk’s interplanetary animal preserve on the Martian plains. Within hours, I received multiple emails. Parents, friends, old classmates, my girlfriend all sent emails. Did you see the article? Maybe they wanted me to know what riches a life in private industry had in store for me? Perhaps they were curious if I was already bathing in Cristal, shopping for yachts, or planning to purchase an atoll among the Maldives? Perhaps the communist sympathizers in my social circles had renewed admiration for my abstention from such extreme opulence. Let’s set the record straight … I thought then. Among the many talented researchers at OpenAI, only one – ONE!! – received “more than $1 million” in compensation. So the headline was off on a technicality. Moreover that one researcher, Ilya Sutskever, was (a) possibly the world’s best-positioned ML researcher under the age of 40 having through talent and luck been party to many of the breakthrough papers at the outset of the deep learning tsunami, and (b) was the research director for the entire enterprise. Was it that unusual for the head of a nonprofit with a 1billion dollar endowment to pull a big salary? The other outlier, Ian Goodfellow, earned $800k. However, he might be among the five most famous machine learning researchers in the world, having invented Generative Adversarial Networks (commonly called GANs) and having authored the most popular deep learning textbook. Perhaps this didn’t quite substantiate the generic claim. The other salaries, while high, weren’t that crazy. Some researchers “with more experience in the field” made between $275-$300k. I know of several undergraduate students who are earning $200k+ in total compensation as developers at FaceBook and Google, among whom half could not figure out an algorithm to prepare spaghetti with tomato sauce. Is it that crazy that a few famous machine learning researchers would make 1.5x their salaries? While the job market for AI researchers was undeniably hot, perhaps this was a bit of a fish story? Those innocent days, back in April 19th. How naive I was. How naive we all were. You see, exponential growth doesn’t just plod along, gradually. One day you’re chewing on your Bazooka bubble gum and exponential growth drops out of the sky wearing anti-gravity boots, smacks you in the face, and blasts off through a tesseract into hitherto unexplored regions of spacetime. To give you a better feeling for what this looks like, let’s take a look at the exponential explosion of technology over the past 4 years. 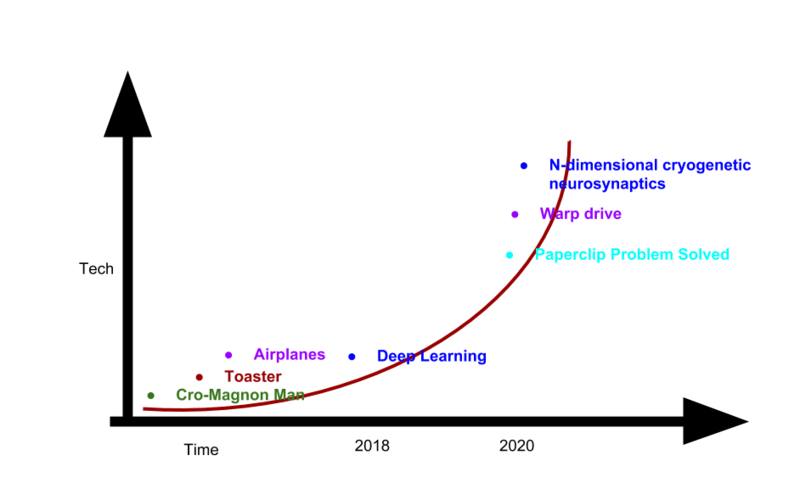 The exponential growth in AI (doubly exponential, but let’s not get hung up on technicalities) is similarly jarring. And it has, in turn, induced exponential growth in AI job prospects. Back in those innocent waning days of April, just as I contemplated a rejoinder to the New York Times, I received an unexpected call from Alex Gorsky, CEO of Fortune 500 mainstay Johnson and Johnson. He wanted to talk about AI. Negotiations got off to a rocky start. At first, I thought really? Johnson and Johnson is getting into AI research? Gorsky’s eyes narrowed and he began to tell me the story of how Johnson and Johnson became an AI First company. How should each bristle on a smart toothbrush decide which way to turn? How would a smart baby powder bottle decide the precise pattern by which to spray out into the air? These are fundamental machine learning problems. And they require fundamentally new machine learning solutions. Cognitive computing isn’t going to cut it. Watson’s blew their entire budget on marketing and the Google Brain turns out not to even be a Brain! It’s time we cut to the chase and solve machine learning, as only Johnson and Johnson can. While Ilya’s take-home might have seemed eye-popping back in April, I soon learned that even interns these days (post-May 2018) make easily 8 figures. Moreover, we quickly ran into the problem that salary scales were shifting so quickly that any agreed-upon number was no longer relevant by the end of the conversation. Finally, we settled on a new concept called the Squillion System of Currency (SSC). We still say “a squillion dollars” but that’s a misnomer to spare the casual reader the trouble of wrapping their minds around the true nature of the SSC. Here rather than measuring AI compensation in fiat currency, which is too brittle to support the great strain of new AI salaries, the SSC dispenses compensation in the form of post-AGI Singularity shares of wealth. After a few more precious minutes of haggling, we finally settled on the sum of $19 Squill. So while it’s been a nice run in academia, it’s with both joy and sorrow that I announce that I’ll be leaving public life to join Johnson and Johnson as their first-ever Inter-Global Head of Artificial General Intelligence Research. Disclaimer: Several fake lawyers were consulted on the ethics and legality of using a fake article to promote a fake career move, all consented. The problems you have in J&J are special cases of Deep RL and you must be aware of Blockchain technology too. This looks straight out of The Onion. On a second thought, the time is ripe to start the equivalent of The Onion for machine learning. The photo caption is priceless. “Those figures all include signing bonuses.” Signing bonuses are often paid out over multiple years as a retention incentive. So it may not even be appropriate to include the entire amount in annual compensation. True. My 19 squillion are actually vested monthly over 19 months, with a 1.9month cliff. So perhaps only reasonable to count them as 12 squillion per annum. Brilliant post! Sometimes it takes nonsense to make sense out of nonsense!